I had a request recently for an ice cream recipe that contained no eggs. There are two main kinds of ice cream in the U.S., custard-style ice cream and Philadelphia-style ice cream. So that it is clear what the differences are, think of it this way: Haagen Dazs and Ben & Jerry’s ice creams and gelati are custard-style frozen desserts, and Breyer’s and Turkey Hill Philadelphia-style are “Philadelphia-style ice creams. Since Breyer’s mint chocolate chip and vanilla are my two favorite ice creams, I guess I like this one better. I was discussing ice cream the other day with my peaches purveyor the good folks at Brooklawn Farm Market, and the subject of peach ice cream came up. 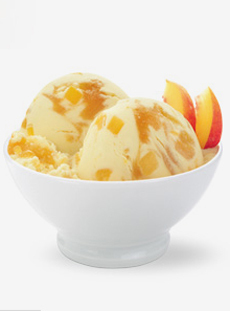 One of the girls in the store asked me if I knew a good peach ice cream recipe, since she is allergic to eggs. So I went to work, and came up with this little gem. Try this for a wonderful treat. The key here is to follow your ice cream maker’s instructions exactly. If I’ve learned something from making ice cream, it’s that my ice cream maker, the Cuisinarts (Cooks’ Illustrated’s favorite one) recommends freezing for 20 minutes, and doing it longer makes the finished product worse, not better. So try this and let me know how it works out.